G-UNIT RIDERZ is a Motorcycle Stunt Team started by two brothers Bee Jay and Moe, who presented this idea to their long time friend 50 CENT, who also has a great love for motorcycles and rides them himself. He In-fact many years ago inspired them to ride by coming though the hood pop-pin wheelies, doing burn outs and straight riding like an animal. After seeing that they were hooked and knew immediately that was for them. Watching 50 gain respect and notoriety from coming thru Guy Brewer Boulevard wheelieing the whole strip was an adrenalin rush for them. Soon after they scraped up some cash and bought themselves their first bikes in 1994 and the rest is history. Team G-Unit wanted a top flash design with them on the bikes. We did the best we could with the photos supplied. We gave the page a street feel. 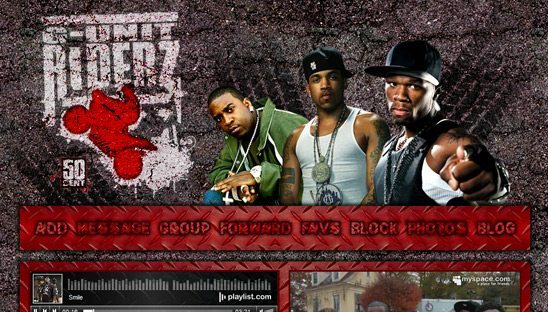 Team G-Unit also wanted the music player to have there feel, so we used the playlist.com free player and added our own custom skin to it.